Our Story • Mission • Goals and Objectives • Why? In partnership with the Equity Trust, a national farmland preservation organization, White Oak Farm purchased 62 acres of farm and forest land in Williams, Oregon during the Fall of 2002. Our vision is to create a farm that is an ecologically sound and economically viable center dedicated to teaching, cultivating an ecological agriculture and distributing its bounty, and preserving and propagating a wide diversity of edible, medicinal, and wildlife plants. 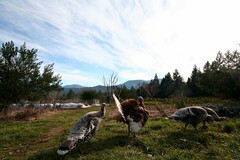 White Oak Farm is located in the beautiful and biologically diverse Siskiyou Mountains. 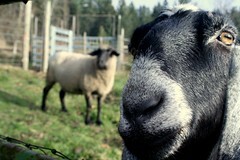 The farm is situated on a gentle south-east facing slope, surrounded by forests of pine, oak, madrone, and Douglas fir. 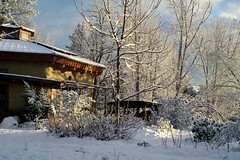 We are blessed with three ponds for irrigation, swimming and wildlife habitat, a two acre organic garden, pastures, an orchard of over forty fruit tree varieties, ample space for camping and hiking, a straw bale-cob farm house, communal kitchen, yurts and tipis for community housing, outdoor showers and composting toilets. The farm is currently home to five community members, small flocks of chickens and turkeys, a small herd of goats and sheep, and many thousands of honey bees. White Oak Farm & Education Center is dedicated to cultivating connections between people and their local ecosystems by pursuing community-based food security, fostering agricultural and ecological diversity, and teaching the arts of sustainable living. White Oak Farm seeks to be a part of a growing worldwide movement to discover, live, and communicate what works for the future of all life. Our piece of this vision is to help form relationships between humans and our food, our home places, and the natural systems of which we are a part. We strive to put our vision into action by growing a farm and education center in Williams, Oregon that is healthy, diverse, and productive and shares its bounty with the surrounding community. The land is the physical and spiritual heart of White Oak Farm. It is becoming an ecologically sound and economically viable center dedicated to teaching, cultivating an ecological agriculture, and fostering biological and agricultural diversity. 1. To increase the awareness and knowledge among children and adults of ways to live harmoniously with the earth. 2. 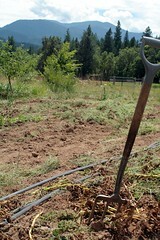 To help cultivate a community in which people can access as much locally grown health-giving food as possible. 3. To encourage the diversification and health of local landscapes, farmlands, and neglected native forests. 1. Create a diverse, productive, and healthy farm organism based on the principles of Permaculture design, bio-dynamic and organic management, renewable energy, and natural building. 2. 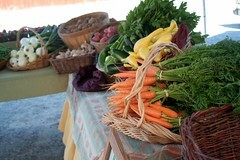 Grow a Community Supported Agriculture (CSA) program. 3. 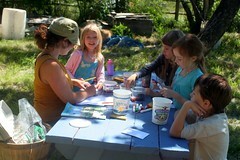 Host school visits in the spring and fall and offer summer children’s farm camps. 4. Hold Permaculture Design and Natural Building courses and workshops devoted to sustainable living skills. 5. Develop reforestation and wildlife habitat planting projects. 6. Develop education programs for high school students. 7. Create an internship program in organic farming, children’s education, and natural building. 8. Disseminate beneficial plants by holding spring plant sales and a winter scion exchange. The need is clear; as a society we must find new ways to live without destroying ourselves or the earth. At the most fundamental level we must find new ways to relate to our food and its life cycle. The current system of corporate industrial agriculture is not able to meet this challenge. Corporate agriculture places short-term economic gains over the long-term consideration of our relationship with each other and the earth, and is incredibly harmful to our soil, water, and plant and animal life. Only a new, ecologically sound approach to farming can stop this destruction. There is a need then for novel farms that can not only produce food, but also promote a healthy environment and provide education in the values and techniques necessary to insure a sustainable future. . . to grow hope as well as food.